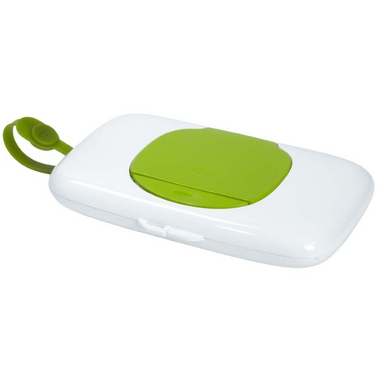 Whether it’s for on-the-go diaper changes or clean-up after a snack at the park, the OXO Tot On-the-Go Wipes Dispenser is perfect for keeping wipes handy while on the move. A simple, one-handed push of the button reveals a large opening for easy access to wipes that easily dispenses one wipe at a time. The handy strap means you can secure it to your stroller or diaper bag handles, and the slim shape easily tucks into bags or purses. It is a bulkier than I expexted, it does hold quite alot of wipes. However, they do dry up, check them before going out. I got this so I didn't have to carry around a full thing of wipes in the baby bag. I wish it was a little lighter, but i don't think it's heavier than any other wipes dispenser. It's is easy to fill.